The River Spey is the third longest in Scotland (the Tay and the Clyde are the top two) with a length of 172 kilometres. It is very well know for it’s Salmon and also for the whisky distilleries that have grown up along its banks. 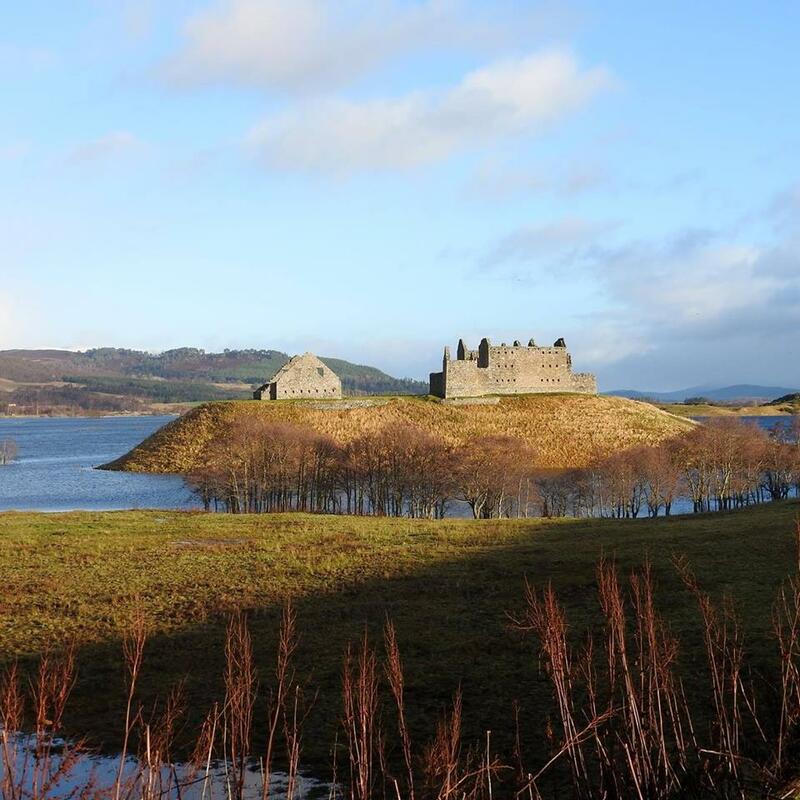 The river itself starts in the very southern part of the Monadhliath massif, a large area of inaccessible upland, sandwiched between the A9 and Loch Ness. Loch Spey is not that big, but it forms the headwaters of the river in the middle of the Corrieyairack Deer Forest. The famous Corrieyairack Pass lies just to the north of the loch. As the river descends it was bridged by the military road (see the blog on Ruthven Barracks) at Garva, the first major crossing of the Spey. Off to the south west is Glen Spean, a river that heads west to the River Lochy. Spean means the little Spey and it is thought that Spey means “the thorny place” perhaps referring to Brambles or Hawthorn. The Spey passes through the small village of Laggan where you can visit the excellent Laggan Stores for a cup of tea and some cake. 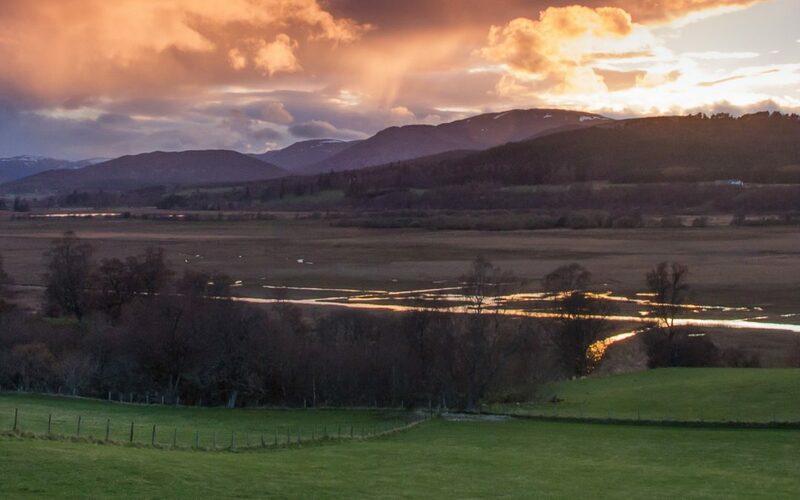 The Spey moves east past Newtonmore and Kingussie until it disgorges itself into Scotland’s largest upland floodplain, Insh Marshes National Nature Reserve. This wetland covers 10 square kilometres and when the Spey is in spate it turns into an inland sea. The RSPB own the site and there are some hides you can visit. 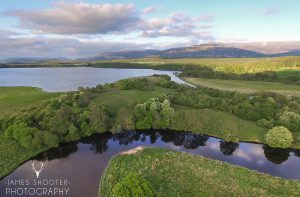 The Spey then flows into Strath Spey (a U-shaped valley) and on to Loch Insh, this is a great place to try some sailing or other watersports and of course there is a cafe at Loch Insh. There is an unusual building there surrounded by ski lift chairs and this was the original Ptarmigan restaurant at the top of Cairngorm ski centre. It was dismantled in 2000 to make way for the new development but purchased and rebuilt here. The Spey gathers pace and is bolstered by the River Feshie as it heads north to Aviemore, at this point it is not such a big river but the addition of the waters from the River Dulnain speeds its volume and flow. You may be surprised to know that pine trees from the forests of Rothiemurchus and Abernethy were floated down the Spey until the early 20th century, in a good spate it took 12 hours to float the 80km downstream. The timber was used to make ships down at Kingston, London. The logs were also bored out to make water pipes and you can still occasionally see these when they dig up the streets of London. From here we pass towards Grantown-on-Spey, under the 1931 new Spey Bridge that replaced the one further downstream dating from 1754. Prior to that you had to either wade across or get a ferry. The river is now broad and fast, passing many distilleries on its way to the sea. 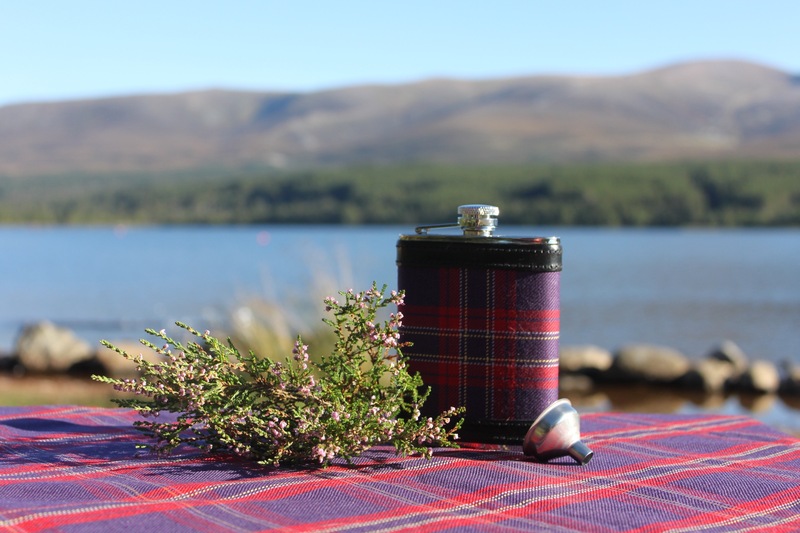 One of my favourites is the small distillery of Cardhu; you could fill one of our Hunter hip flasks with this delightful tipple. One of the most beautiful bridges on the Spey is the Craigellachie Bridge designed by Thomas Telford. It was completed in 1815 and is the oldest cast-iron bridge in Scotland. In nearby Craigellachie there are all sorts of things to do an see, the Speyside Cooperage being a firm favourite. 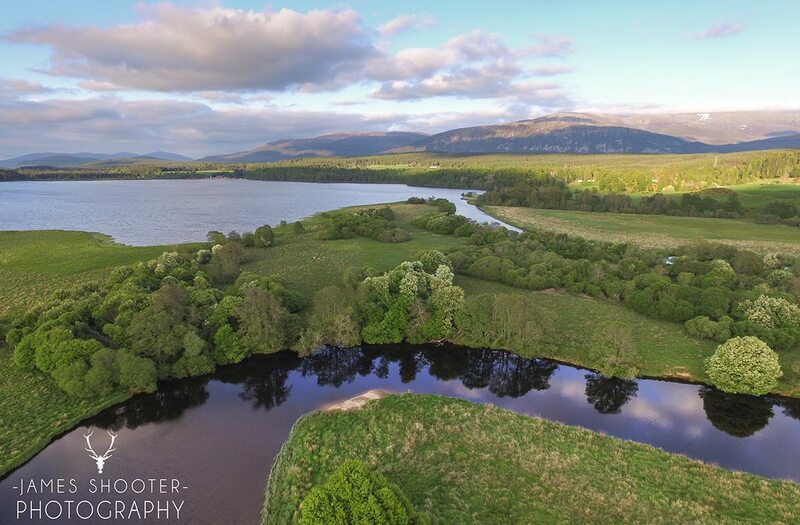 Soon the river is at the sea at Spey Bay and disgorges its cool, fresh water into the Moray Firth, this acts as a gateway for the Salmon to head upstream to spawn in the burns that they were hatched in, which attracts the Bottlenosed Dolphins to feed on this summertime bounty. The Whale and Dolphin Conservation Society have a visitor centre there. It is based in the old Salmon netting station and you can look at the huge Icehouse at Tugnet, this gives you some indication of just how many Salmon they caught in the 1800’s. For a tour of its full length you could get us to organise a special tour for you.